Background: United States, 1864. The civil war that both sides had expected to end swiftly has dragged into its third year. The Union blockade of the South, the Anaconda Plan developed by General Winfield Scott and established in 1861, has finally started to take its toll on the Confederate military and its civilian population. Southern logisticians estimate that with current supplies, the South will be forced to surrender due to inability to maintain its military and severe economic hardships in five months. Meanwhile, in the North, mounting casualties among Federal troops threatens public support for the war. Northern war casualties are approaching 600,000; Washington politicians conjecture that if the figure rises to 700,000, their constituents will demand an end to hostilities and an accommodation with the South. Objective: Be the first side to drive their opponent to the breaking point through a careful combination of naval strategy and army operations - force the surrender of the Confederacy by exhausting their war stocks (zero weeks remaining), or inflict an unacceptable additional 100,000 casualties on the Union (700,000 total), forcing the North to sue for peace. Garrison Garrison Minor skirmishes and disease, spread from long periods of inactivity in camp, takes its toll on the troops. No supplies lost, North suffers 2,000 casualties. The sixth card is simply a quick reference card showing the scoring matrix for the various card combinations. Play: Players start by placing their Army Garrison card and their Navy Raider in front of them, head to head with their opponent’s army and navy cards. Each turn commanders can elect to change one of their strategies, i.e. replace either their current army card with the one in their hand, or change out the navy card. Players must have one navy and one army card in play at all times. After deciding which card to change, the new card is placed face down in front of the player. Once their opponent has selected their card, both new cards are flipped over and the appropriate old card placed back in their hand. Notice that at the top of each card, only one color (or if the cards are printed in black and white, one patterned) area will match the corresponding area on their opponent’s card. This indicates the outcome of that card pairing. Players then tally up the results for BOTH their navy-to-navy pairing and army-to-army pairing based on either the score on the cards, or by using the Scoring Table card. Note that naval action only affects Southern war stocks, while army action affects both stocks and Northern casualties. Note that if a player does not want to change any cards, he plays the special “No Change to Orders” card, and simply leaves the existing cards in play. In multi-player games, players can only communicate by passing messages verbally to other commanders seated immediately beside them, similar to the “Telephone Game (http://en.wikipedia.org/wiki/Chinese_whispers).” Washington and Richmond can attempt to pass a grand strategy to the rest of the team at the beginning of a turn, but the word must be passed “down the line.” In games with four or more players per side, local commanders will need to communicate as no more than three consecutive Union commanders can play “Strengthen Blockade” the same turn; and no more than two adjacent Confederate commanders can play “Lift Blockade” the same turn. To launch a major land Campaign, at least two adjacent commanders on either side must play the Campaign card. Scoring Example: In a single pair of facing players, the Northern player ends the previous turn with his navy card “Strengthen Blockade” and his army card “Campaign” in play. 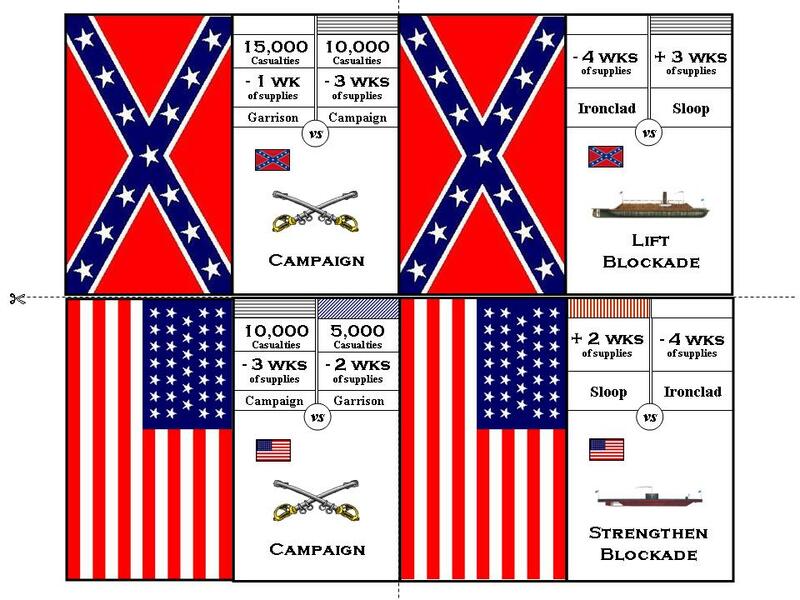 The Southern player has his navy “Raid Commerce” card and his army “Campaign” card in play. Each player picks one card from his hand and places in face down before him. When ready, both players flip their new card over. 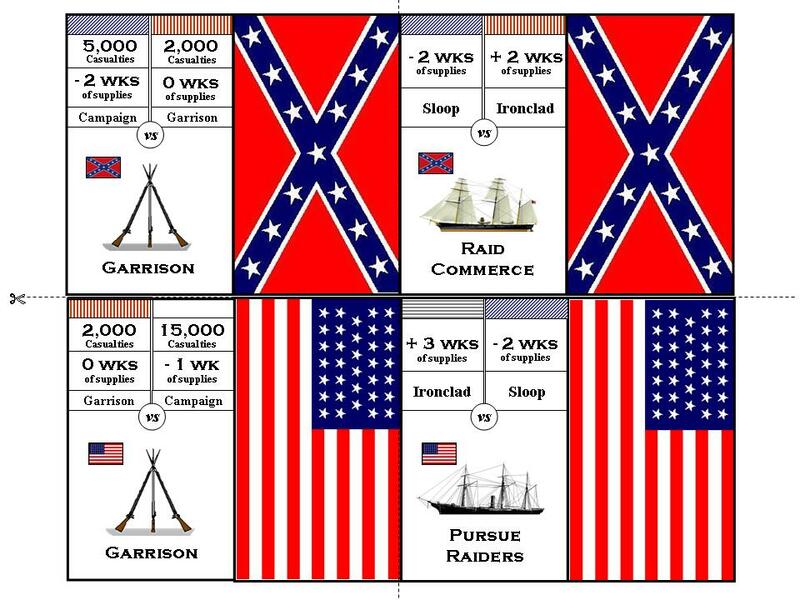 The Southern player reveals a “Garrison” card, while the Northern player has played “Pursue Raider.” Looking at the tops of the navy cards, -2 weeks worth of southern supplies match, and -2 weeks of Southern supplies and 5,000 Northern casualties match on the army cards. Net result: South loses 4 weeks from their counter, North adds 5,000 casualties to theirs. 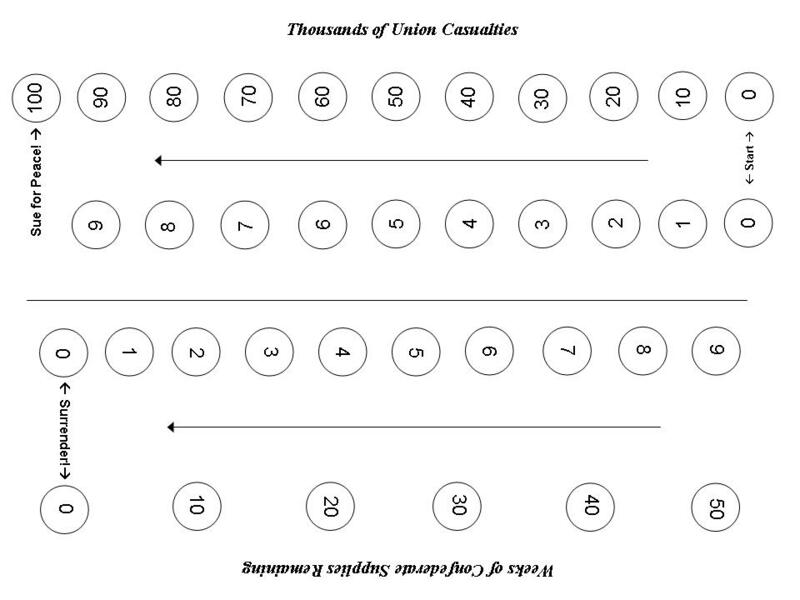 Here is a simple score card; use pennies to keep track of the score. Average: Results of each North vs. South pair are mathematically averaged (rounding down) to produce the final score for a given hand. Cumulative: Results for each North vs. South pair are simply added together. Makes for a very fast game! Elimination: Each opposing pair plays until there is a winner. The team with the most number of ‘winners’ is the overall victor. Civil War resources abound on the internet! A good all round site is http://americancivilwar.com/. 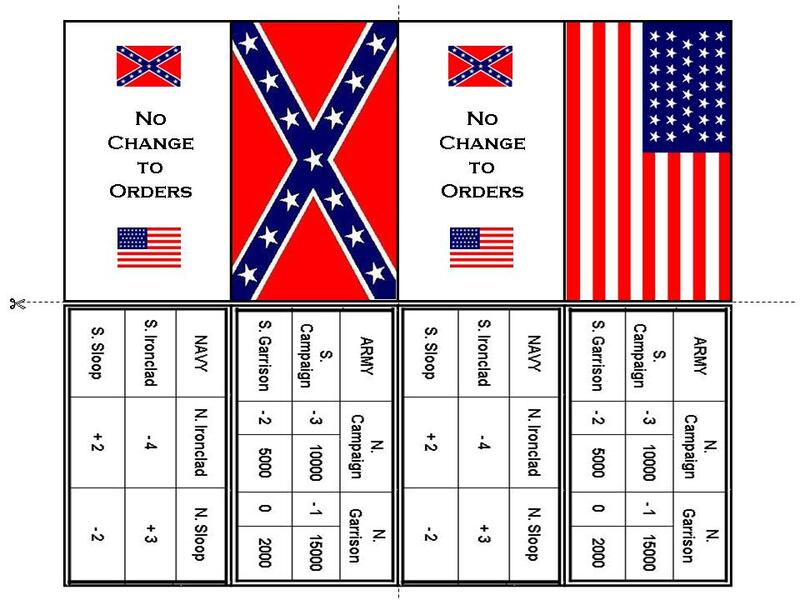 Several of the game play “Orders” were based on actual reports and messages from the Civil War (see http://www.swcivilwar.com.) Where possible, authentic text has been used, and an attempt made to keep the appearance of 19th century correspondence, complete with period signatures. If you study the “payoffs” for the various move combinations, you’ll conclude that the South is at a distinct disadvantage. Using purely random moves, the South will lose 70% of the time, usually around the tenth turn. If on the other hand, the South shifts their naval strategy to pure commerce raiding and does not attempt direct confrontation with the Union navy, their chances of winning go up to 40%, given that all other moves remain random. If the South additionally shifts their land strategy to Garrison and avoids the resource draining Campaigns, odds of winning shift to just over 50%, again assuming the North remains random. If, however, the North catches on to the Southern raider/garrison strategy and counters with pursuing the raiders and either campaigning or garrisoning, the South’s fate is sealed between Turns 5 and 10. You can also improve the South’s odd by simply increasing the number of weeks remaining at the game’s start from 20 to 30.